Denna produkt ger dig 1094 bonuspoäng. Vagnsset med 4 godsvagnar typ DR, totallängd över buffertar 200 mm, epok IV. 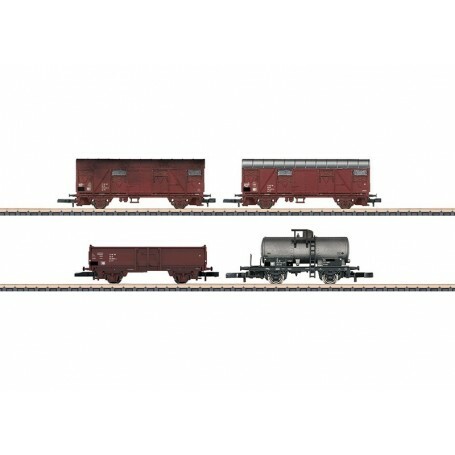 DR Freight Car Set Consisting of 4 Cars	Model: Of the 2 type Gs 1204 boxcars, one of them has light weathering and the other car is not weathered. The type Uhk 0700 tank car also has light weathering. The type El 5044 high side gondola (former Omm 52) has no handbrake. All of the cars have different car numbers. All of the cars are a special version and they are not available individually. Total length approximately 200 mm / 7-7/8'.